A lifelong AFSA member, Ted served as the association’s elected president from 1989 to 1991 and as FSJ Editorial Board chair from 2005 to 2011. 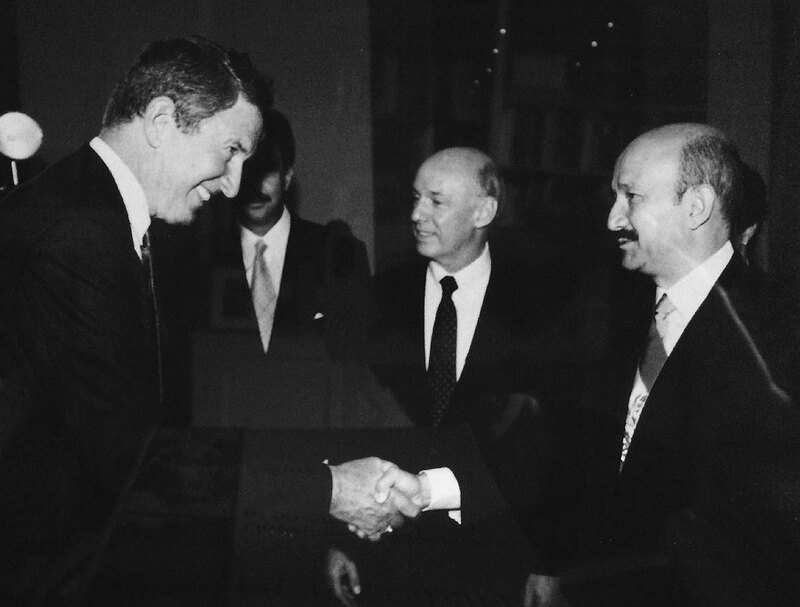 Ted Wilkinson shakes hands with President Carlos Salinas de Gortari of Mexico while serving in Mexico City in the early 1990s. If one were going to put a Foreign Service character into a novel, one could hardly come up with a better name than “Theodore Stark Wilkinson III.” In keeping with the sheer heft of that triple-barreled moniker, the actual bearer of that noble name was a strikingly tall man with a proud lineage and imposing intellect. Yet he was known to one and all simply as Ted—a gentleman and a gentle man, as his friend and colleague Tom Boyatt aptly puts it. Ted Wilkinson was born in Washington, D.C., on Aug. 27, 1934, the son of Vice Admiral Theodore Stark “Ping” Wilkinson and Catherine Harlow Wilkinson. His father, a Medal of Honor recipient for the 1914 Veracruz campaign in Mexico, would later serve as chief of naval intelligence. Vice Admiral Wilkinson became commander of the Third Amphibious Force in the Pacific in 1943 and was credited with developing the “leapfrogging” strategy designed to seize control of the Southwest Pacific islands occupied by Japan. After graduating with a B.A. in political science from Yale in 1956, the younger Wilkinson followed his father’s footsteps into the U.S. Navy. (He later earned a master’s degree in international relations from The George Washington University.) After four years as a naval intelligence officer, Ted joined the Foreign Service in 1961. Over a distinguished 35-year career, he developed specialties in Latin American affairs and arms control, serving as minister counselor for political affairs in Mexico City (during his second assignment there) and Brasilia, both during the 1990s. He also served at the United Nations and NATO, and in several European and Latin American capitals. Ted’s diplomatic contributions continued even after he retired from the Foreign Service in 1996. For the next two years, he served on the ambassadorial-level, four-nation Guarantor Support Commission, which helped reach a 1998 accord to end a bloody, long-running border dispute between Peru and Ecuador. A lifelong AFSA member, Ted served as the association’s elected president from 1989 to 1991, and returned to the Governing Board as a retiree representative from 2003 to 2005. He also remained an active participant in the group of former AFSA presidents to whom the current leadership has turned on occasion for experience-based advice. An eloquent member of that cohort, Ted spoke out for the role of America’s professional diplomatic service, and made clear publicly and in communication with Congress that the appointment of unqualified fundraisers as ambassadors was counter to our national interest, and a possible contravention of the Foreign Service Act. It was during his six-year stint (2005-2011) as chairman of the Foreign Service Journal Editorial Board that our paths first crossed. I was truly privileged to work closely with him in my capacity as the magazine’s editor. As with everything he did, Ted took his responsibilities as Editorial Board chairman to heart. He prized incisive writing and strong points of view, even when he disagreed with their content. I still recall several instances where he shook his head over what he viewed as a needlessly provocative Speaking Out column—then not only voted for publication (with judicious editing), but urged his colleagues to follow suit. 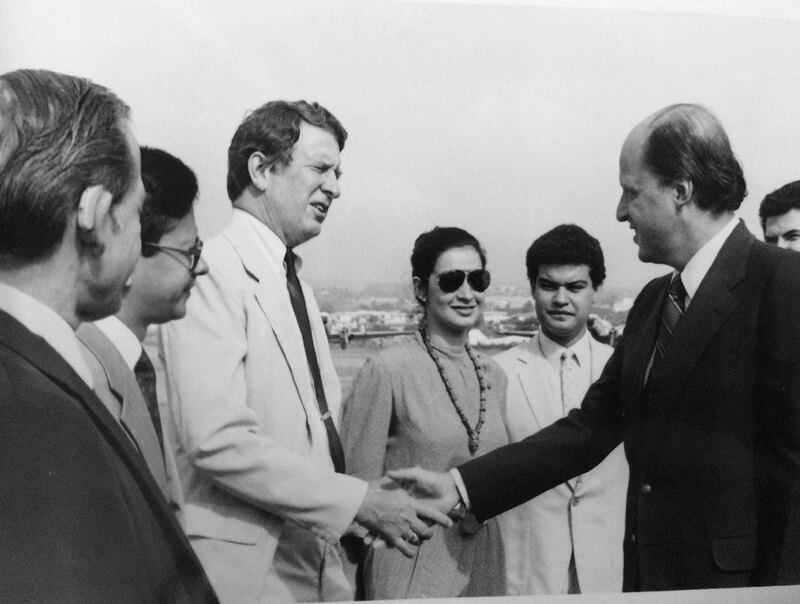 Ted Wilkinson shakes hands with Ambassador to Honduras John D. Negroponte while serving in Tegucigalpa in the mid-1980s. In the same spirit, Ted strove to identify and recruit the best possible contributors to The Foreign Service Journal. Yet he never forgot that while many of the AFSA members who submit material for publication may not be naturally gifted writers, their insights and concerns deserve attention. He brought a similar humanity to managing the Editorial Board, which is comprised entirely of volunteers who sometimes require a gentle nudge to work well together. The one drawback to having Ted in that role was the fact that board members traditionally do not write articles for the Journal, to avoid the potential awkwardness of the peer review process. Fortunately, that stricture does not apply to book reviews, which fall under the editor’s direct purview, and Ted reviewed more than a dozen titles for me. Whether he was assessing a policy study, memoir or novel, those write-ups were consistently well-written and fair, requiring virtually no editing at all. The second piece was “Mexico’s Anguished Decade,” part of a focus on Latin America in the June 2011 issue. Though he was writing some 15 years after leaving the Foreign Service, Ted’s analysis was firmly grounded in current events. Far from resting on his professional laurels, he continued to teach U.S.-Mexican border studies courses at the Foreign Service Institute, traveled regularly to Mexico and kept up with the academic literature. He contributed frequently to the online journal American Diplomacy, on whose board he served, and chaired the Membership Committee of the Washington Institute of Foreign Affairs. Ted was anything but a drudge, however. He avidly pursued his passions for racquet sports, bridge, chess and backgammon, and played poker monthly with several Foreign Service buddies. And above all, he put his family first. He and his beloved wife, Xenia Vunovic Wilkinson, herself a retired FSO, were the parents of Julia, his youngest daughter. Ted had three children—T (who predeceased him), Rebecca and Jennifer—from his first marriage. He was the proud grandfather of four: Maxwell, Madeline Rose, Christopher and Ian. Ted and Xenia have been longtime supporters of the Foreign Service Youth Foundation. In addition, Ted was a member of Diplomatic and Consular Officers, Retired, the Metropolitan Club, the Chevy Chase Club and the Society of the Cincinnati. Ian Houston, AFSA’s executive director, recalls that during a phone conversation shortly before Ted died of cancer on Jan. 25, he spontaneously told him: “We love you, Ted.” He added that everyone at AFSA regarded Ted as a model board and committee member. I heard many of his colleagues and friends express similar sentiments at his Feb. 7 memorial service. Ted Wilkinson truly was a paragon. He will be sorely missed. Steven Alan Honley, a Foreign Service officer from 1985 to 1997, is The Foreign Service Journal’s contributing editor.